The young man walked down the quiet tree-lined side street toward the college he attended. As he rounded the corner onto a busy thoroughfare he noticed about half a block away, on the same side of the street as he, several construction men working on the overpass he needed to cross. Instantly, the young man was gripped with fear. He was certain that if he walked by them, they would call him a derogatory name or sneer at him, or silently judge him. He couldn’t risk humiliation so he quickly walked into the street dodging cars and trucks to get to the other side. He heart raced with anxiety long after he passed the men and was sitting in his class. Crazy story, right? What a pathetic person…. Well, that pathetic, crazy person was me. I was about 33 years old, and that was how I thought. The path of my life has been directed by Fear. Fear fueled by the “knowledge” that I was different from other guys. I wasn’t athletic, popular, smart, outgoing, or masculine. I was shy, and introverted. I never spoke up to defend myself and I gave into everything that someone, anyone wanted to do. I never had a thought of my own that I could share, for I knew I would be put down for it. I was terrified of making mistakes, of failing, of being seen as a loser. So I hid within myself. And while I feared rejection from my peers, I was already rejected by them. The years of my youth were stolen by Fear. And Fear had caused me to be stunted as an adult, to never voice an opinion, to never make waves, to never disagree. Because in the back of my mind Fear whispered, “you will be rejected if you say/do that.” Procrastination, has been a trademark of mine, nourished by the Fear of failing to do things right, or being seen as stupid. Thus, I generally have put things off for as long as I could. When I became a Christian, Fear took root in my faith and for the first two thirds of my spiritual experience I hid from God, and saw every negative circumstance as a result of my not meeting His expectations and He was judging me for my insolence. Fear told me I would never measure up to what God wanted me to be. But then God broke through my prison of Fear and offered me real freedom. I was at the end of my rope, so I reached out to the hand of grace and began to walk out of my self-imposed imprisonment. Grace showed me that God is greater than any fear this world presents and that I can have an opinion, I can disagree, and I can think or see things differently from others and still be loved by my Celestial Father. 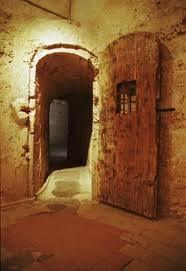 Many prison doors has swung up when touched by Grace and fear has been in retreat. But still, ahead of me, even as I walk hand in hand with Grace down the ever brightening passageway to wholeness, there are yet more cell doors to be opened. And fear has seen this as an opportunity to reassert itself. For it knows that these may be the greatest challenges I will face. In the months/year ahead the choices I have to make will alter much. There is always the risk of losing, of being uncomfortable, and experiencing emotional pain. But in spite of that I have to believe that it is God that has brought me to this point, and He will be with me through it all. In the meantime, I battle with fear once again. This time not alone. For I am convinced of the fact that His grace will be sufficient for me. Excellent post. I deeply relate to this as do too many others. I have learned that the opposite of Love is not hate but fear. Some people who call themselves Christian would suggest your fear was a result of sin–and they would say, the “sin of homosexuality.” I’ve learned that my sexuality is not a sin but that the condition of sin, that which causes me to think or act outside of love, can taint anything. If I give to charity, for example, fearing that unless I give, God won’t bless me, that is a sin. If I feed the homeless all the while resenting them or thinking I am somehow better than they are, that is a sin. We have been trained in “sin consciousness” far too well that we feel that the fear you describe is merited or warranted. God is not taken by surprise by anything we think, say or do. God knows ever aspect of our lives, the good, the bad and the ugly. And yet, God is not disappointed, discouraged, or disgusted. God is absolutely delighted with us, even when buried in sin consciousness. You, my brother are learning to live in that delight and that is delightful to God–and me too. Thank you Joseph. It has taken me many years to understand that the “love of God” is as unconditional as the Bible says. Some have distorted that love and have attached the word “sin” to many things that are not sin, and you made an excellent point in the what looks like “good works” from the outside could actually be “sin” seen from the internal perspective of the person doing it. I battle fear every day, God has always been right here with me. Now knowing that gives me the ability to keep moving forward, albeit sometimes more slowly than other times. thank you for reading and thanks so much for the kind comments as well. Peace to you. Dear Mark, Coming home tonight from another difficult day at work, feeling “not part of my colleague gang” and very much alone , reading your words struck a chord ..and, I think, there are many who feel this way. I have always been afraid, perhaps born that way.. afraid of people, situations,… life, itself. They say the word “fear” appears more than any other word in the Bible, and it must have been something Jesus, himself , experienced many times. His love is stronger than any fear, stronger than any doubts, inadequacies, stronger than all that makes us feel so afraid. Knowing Jesus understands, helps a lot, and, although He may not take away my fears completely, I know He is close by my side and will see me through them. Thank you Mark, for your words – which was just what I needed to read tonight. ..and may you find peace and courage to face your fears. I pray for you…that the God of grace and peace fill your heart with the comfort of His ever present love. You are a precious jewel to Him and His love surrounds you. Thank you for your always kind words. You are a blessing to me and I think God for you. Thank you Leanne. I want to be an open as I can, for there are far too many barriers in the church to people to just be themselves. Thank you too for your openness and your honesty as well. You set the pace for your congregation and your church will be blessed because of you.